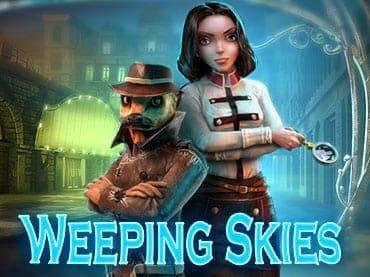 Weeping Skies is a very creative hidden object game with beautiful hand-drawn graphics on every scene. Follow the kidnapping of Puss in Boots and reveal the darker and sinister secrets behind it all. Explore 39 thrilling locations and 19 hidden object scenes. 13 challenging minigames to put your brain to the test. Soundtrack to match the gloomy mood and graphics. Weeping Skies has a story that will surprise you at every turn. Download this amazing puzzle game now. If you have questions about Weeping Skies game, please contact us using this form.